There are some musicians who are great with their craft. These music makers will say something like “Alright, I’m going to go and make a punk record.” And they do, and they continue to make punk records, and they’re awesome at making punk records. There are also musicians who say “Alright, I’m going to make a rock record.” And they do, but then they decide “Alright, now I’m going to do a bossa nova-inspired record.” Can you guess which musician Expwy is? Matt LeGroulx of Montreal is another musician who has been steadily releasing music this year, having just released a full album a mere three months ago. Little Hand Fighter is his latest release, and it’s a sound that you are guaranteed to not hear anywhere else in Canada right now (if you hear something similar to this please do share). As I hinted at in the first paragraph, Expwy has managed to create a genre that blends the smooth sounds of bossa nova with lo-fi pop sensibilities. What does that sound like? Well you can certainly hear the jazz influence in the hypnotic guitar arrangements and the generally smooth feel of the music. You can also hear the experimental singer-songwriter vibe in the way LeGroulx sings. I should also mention that the longest song on this record is just shy of three-and-a-half minutes. That such fleeting songs can leave such a lasting impression surely shows the skill that LeGeroulx has in this genre mashup of his. 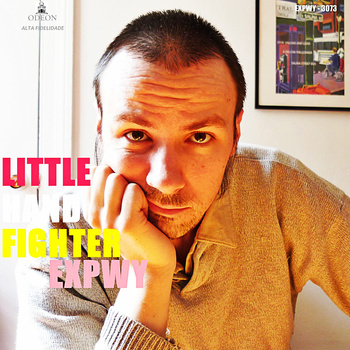 Little Hand Fighter is a perfect soundtrack to whatever you may be doing right now. Just take a listen and be drawn in before you know it. It’s a name-your-price download from Bandcamp.